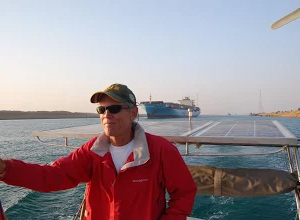 TCC member Michael Lawler transiting the Suez Canal on his three-year circumnavigation of the world. Our next quarterly meeting of the TCC Charter Chapter (Los Angeles/Orange County) will be held on Saturday, March 10, when we gather for the first time at the intimate Newport Beach Yacht Club. TCC members Michael and Barbara Lawler will share their adventures of “Cruising to Yemen through the Gulf of Aden and the Red Sea” as part of their three-year circumnavigation on their own 47 ft. sailboat, Traveler. The couple cruised through the treacherous body of water known as “Pirate Alley” with stops in Oman, Yemen, Eritrea, Sudan, and Egypt before transiting the Suez Canal. “It was all good except for the bad parts, and we had several problems on this leg of our ’round the world cruise,” Michael said. Of course, the bad parts make for more interesting travel and adventure stories. As an added treat, Traveler is scheduled to be docked in a guest slip for pre- and post-program tours. Payment: No later than noon Wed. March 7. For late RSVP, call (818) 502-1988 or email to mgsholer@att.net. Mail payment to Coordinator Michael Sholer at 1431 Columbia Drive, Suite 200, Glendale CA 91205-3505 to THIS ADDRESS ONLY! Checks should be made payable to Travelers’ Century Club. Meal Choices: (must pre-order for this meeting): Charbroiled New York Steak, Charbroiled Swordfish, Chicken Picatta and Pasta Primavera. As is normal, our Charter Chapter meetings alternate between sites in Los Angeles and Orange Counties on the second Saturday of each quarter. Our subsequent 2018 meetings will be in Los Angeles County on June 9 and Dec. 8, and again in Orange County on Sept. 8.